Celebrate the final Friday of the month with a BANG! Earn entries every day in May toward the $10,000 Final Friday Blowout on Friday, May 31st. Twelve winners will split $10,000 in cash! Earn entries beginning 5/1/19. One entry for every five base points earned. Must be present to win. Digital entry ticket activation will begin one hour prior to each drawing on Friday, May 31, 2019. Players Club members must activate all available entries for the drawings by carding in and having activity on their Players Card any time after one hour prior to the drawing time. Players Club members begin earning entries at 9am on Wednesday, May 1, 2019. Digital entries are earned one digital ticket for every 5 base points earned on players card. All entries earned throughout the month will accumulate all month long and will be eligible for any drawing for which the guest has activated their players card and entries. Select VIP guests will be sent a postcard or e-blast with bonus entries valid only on the night of the drawings. The postcard or e-blast must be brought in and presented either to a host or the Players Club in order to receive the bonus entries before 10:45pm on Friday, May 31, 2019. Drawings will take place on Friday, May 31, 2019. Two winners will be selected at each hour and given three minutes to report to the promotional area located in front of the Players Club. If the selected winner does not respond within the three-minute time frame, another winner will be announced, and this process will continue until both winners are present and have been verified. Valid identification is required for the winner to claim their prize. Should a selected winner not have acceptable identification, they will be deemed as ineligible and another winner will be selected in their place. • Guests must be a member of the Players Club and abide by all club rules to be eligible to participate. Use of Players Card is required to generate earned entries and to activate earned entries on each drawing night as prescribed in the above promotional rules and details. • Guests may only win one prize from 6pm to 9pm. Once a guest has won one of the drawings taking place between 6pm and 9pm they will be ineligible for the remaining drawings for that time period. Winners chosen at either the 6pm, 7pm, 8pm or 9pm drawing will be re-eligible to win one drawing at 10pm or 11pm. 10 winners each Friday. Drawings selected by random hot seat every hour from 5pm to 10pm. Selected winners will choose a prize capsule from the payday drum to win up to $1,500 cash instantly! On select Fridays in May (May 3, 10, 17, and 24th) Players Club members will have an opportunity to be randomly selected by hot seat every hour from 5pm to 10pm to win up to $1,500 cash (a total of 10 winners each drawing day). Winners chosen will be announced over the casino microphone and asked to report to the Players Club within three minutes. If a selected winner fails to report to the Players Club within the allotted three minute claim period another winner will be selected and announced. This process will continue until a valid winner has been selected and verified. Once a winner has been verified they will be asked to pull a prize capsule from a drawing drum. The person conducting the drawing will open the prize capsule to reveal the winner’s prize. Prize amounts will range from $100 to $1,500 and will all be in cash. • Guests must be a member of the Players Club and abide by all club rules to be eligible to participate. • Use of Players Card is required to be eligible for random hot seat selection at each drawing time. • Guests may only win once per promotional day. • It is the responsibility of each participant to be aware of casino announcements for the promotion and respond within the allotted time frame to be verified as the winner. 7 winners per day! Drawings every hour from 4pm to 10pm. Winners will be selected by random hot seat to take a spin on the big wheel. BIG WHEEL, BIG PRIZES, BIG SPIN! On Saturdays in May 2019 (May 4, 11, 18, and 25th) Players Club members will have an opportunity to be randomly selected by hot seat every hour from 4pm to 10pm to win up to $3,000 cash (a total of 7 winners each drawing day). Winners chosen will be announced over the casino microphone and asked to report to the Players Club within three minutes. If a selected winner fails to report to the Players Club within the allotted three minute claim period another winner will be selected and announced. This process will continue until a valid winner has been selected and verified. Once a winner has been verified they will be asked to spin the big wheel. The wheel must go around at least one full revolution to qualify as a valid spin. If the wheel does not complete a full spin it will be declared as an invalid spin and the winner will be asked to spin again. Once the wheel has been spun, the winning amount will be determined by what slot the ball inside the wheel stops in. The clicker on the wheel is only for purposes of stopping the wheel and does not determine a prize. The wheel will have winning amounts from $25 to $1,000 cash. Also on the wheel will be double and triple multiplier spaces. If the guest spinning the wheel lands on a multiplier space they will be asked to re-spin the wheel and any amount they land on will be multiplied based on the multiplier landed on with the initial spin. Should the guest land on a multiplier a second or more times consecutively they will be given the benefit of the higher of the two multipliers landed on. 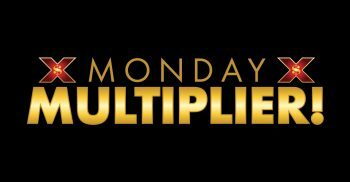 Multipliers will not be combined and the highest multiplier available will be triple (3x). For example if a guest lands on double on the first spin and then on the re-spin lands on triple they will be asked to re-spin again at a 3x multiplier. Should the guest spin and land on triple first and then on the re-spin lands on double the multiplier will not be lowered, they will get to re-spin again at triple (3x) because it was the higher of the two multipliers landed on. Also on the wheel will be a space with “Re-Spin or $200.” Any winner landing on this wheel space will be given the option to take $200 cash or to re-spin the wheel and whatever amount is landed on will be the prize. Should a guest choose to re-spin the wheel and subsequently lands on a multiplier the same rules as above shall apply and they will re-spin to see what amount will be multiplied (based on the multiplier amount landed on with the re-spin). Should a guest land on a multiplier with their first spin, then on the second spin lands on “Re-Spin or $200” they will be given the option to multiply the $200 by the multiplier amount landed on or re-spin the wheel and apply the multiplier to that re-spin and the amount landed on. • If the selected winner cannot be validated through production of proper identification within the three minute allotted time frame or has otherwise been disqualified from participation, another winner will be chosen and the initial winner selected will be deemed as invalid for that drawing time. Players Club members must use their Players Card while gaming during the times of the promotion to be eligible to receive the gift. Only base points earned between 12pm and 10pm on the dates of the promotion will be applicable to the earning requirement. Once the required base points have been earned the Players Club member must go to the Players Club to receive their gift. Players Club members must collect their gift at the players club before 10pm each promotional day. Earn and Get Gifts are available only while supplies last on a first come, first earned basis. There will be no rainchecks, substitutions or special offers in the event any gift runs out. • Use of Players Card is required and must be used and properly inserted while gaming in order to accumulate points and to be eligible to receive the Earn and Get gift. 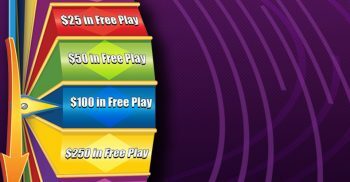 • Earn and Get prizes/gifts may not be exchanged for cash or free play in lieu of the prize. • Guests must collect their prize on the date of the promotion and prior to the end of the promotion (10pm each day). • Earn and Get Gifts are available only while supplies last on a first come, first earned basis. There will be no rainchecks, substitutions or special offers in the event any gift runs out. Every Monday in May 2019 all day (open to close). Players Club Members with a Progressive or Jackpot level players card will receive multiplied points based on their card level. Progressive card level will receive 2x points and Jackpot card level will receive 3x points all day, every Monday in May 2019. The Players Tracking System will automatically multiply the amount of earned base points on eligible Players Club accounts during the promotional period. • Must be using a Players Club card while gaming on the casino floor to participate in promotion. • Excluded patrons cannot participate in promotions. • Must be present during prescribed dates and times of promotion to receive point multiplier. • It is the responsibility of the Players Club member to ensure that their players card is properly inserted and reading while gaming in order to receive the multiplied points (if they are in the applicable players card level Progressive or Jackpot). • This promotion is not applicable to Classic players card level card holders. • Must present a valid State/Federal photo identification before physical, monetary, or free play prize, award, discount, or offer can be claimed. • Management reserves the right to cancel, change or modify the promotion without notice. • In the event of a dispute, decisions of management will be final. • Each winner is solely responsible for reporting and paying any and all applicable taxes related to the prize(s) and paying any expenses associated with any prize which are not specifically provided for in the official rules. • Each winner must provide the Company with valid identification and a valid taxpayer identification number or social security number before any prize will be awarded. Any person winning over $600 in prizes from the Company will receive an appropriate IRS form 1099 at the end of the calendar year and a copy of such form will be filed with the IRS. • For names of winners, available at the conclusion of the offer, send a stamped, self-addressed envelope to: Marketing Department, Vernon Downs Racetrack LLC, 4229 Stuhlman Rd, Vernon, NY, 13476. Earn triple points on your Player’s Club card!